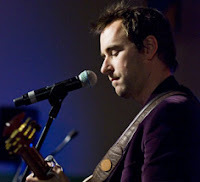 Damien Leith won "Australian Idol" in 2006 and has stayed pretty quiet with hardly any radio play or fame here in the States. Damien's soft and sultry voice is...did I just type "soft and sultry?" Uh hem. What I meant to say was that he sings really good...like a man..ya!..a CAVEMAN!! grrrr!!! His style is like Keane & Maroon 5 meets caveman grrrrr!!! I'm sure you'll enjoy these 3 caveman tracks by Damien "Unga Bunga" Leith.